Thank you for your interest in our film. Due to different distribution contracts and licensing, DVDs are sold from different sources. Educators and community organizations, please respect purchasing and screening guidelines. 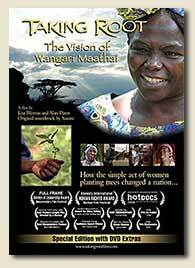 Your support of Taking Root: The Vision of Wangari Maathai supports the continued work of independent documentary filmmakers. For Universities and Community Organizations ANYWHERE EXCEPT CANADA: Please go to New Day Films for sales to U.S. universities, colleges, schools, community organizations or libraries. For CANADIAN customers:Canadian Universities & Community Organizations: Order the film by contacting Terry Brandwein at terry@criterionpic.com or 1-800-565-1996, ext. 223. Canadian High Schools and Public Schools: Order the film by contacting Diana Baudich at diana@criterionpic.com or 1-800-668-0749, ext. 220.